The result of my foraging. I was wandering recently in the village where I grew up looking at what was growing – kind of checking out nature’s supermarket for signs of what to expect as the season rolls out. I have already partaken of the tender new dandelion greens, which were delicious. Spring is the time when all the new young growth begins to show. It’s also the time when everything isn’t so grown in that things are difficult to see. It’s the perfect time to take mental notes on what is growing where. 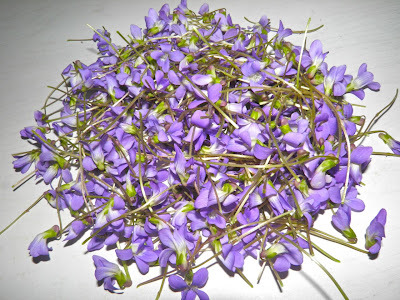 One of these edible spring flowers is the blue marsh violet, botanically called Viola cucullata. 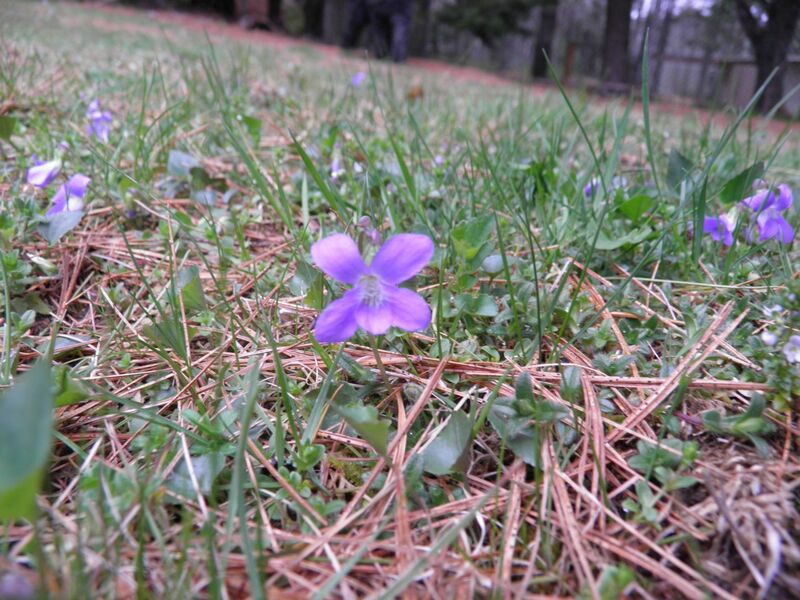 It is the largest flowered wild violet we have in the far eastern provinces of Canada, but not the only violet. The region is home to 15 different species. If you count Newfoundland and Labrador the number increases to 27. Most are a delicate blue, but we have smaller varieties with beautiful quarter-to-half inch blooms that can be white, or on occasion yellow. I have probably seen only three different kinds, but the species distinctions are probably quite subtle and I really didn’t know what I was looking at. The most common variety – the larger blue – are quite beautiful but lack any discernible scent. When growing thickly “en masse,” they look like little bits of fallen spring sky scattered around on the ground. It’s quite a sight. Violets grow from a ground-level rosette of leaves, each flower being borne at the end of an individual stem. These stems are so thin the blooms easily dance in the wind. It was quite breezy the day I came across a large patch, so it was a little difficult to actually get a still shot with my camera where they were growing. The stalks themselves are anywhere from 3 to 6 inches tall. They prefer a somewhat wet environment, but aren’t averse to showing up in clearings where the ground doesn’t get too dry during the day. That’s where I found them. Violets are easily incorporated into foods, both the flowers as well as the leaves. Violet leaves are spade-shaped and sometimes have a darker green variegated margin. 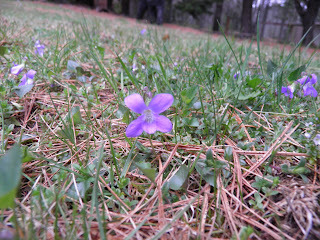 Violets really don’t look like anything else so it’s hard to be confused as to what they are, and all are edible. So next to no worries. The young leaves are high in Vitamin C and are a good addition to a salad. Their taste is not offensive at all, a little peppery (as all young greens), and difficult to describe. The flowers can also be added to salads where they really make a statement with their clear blue colour. 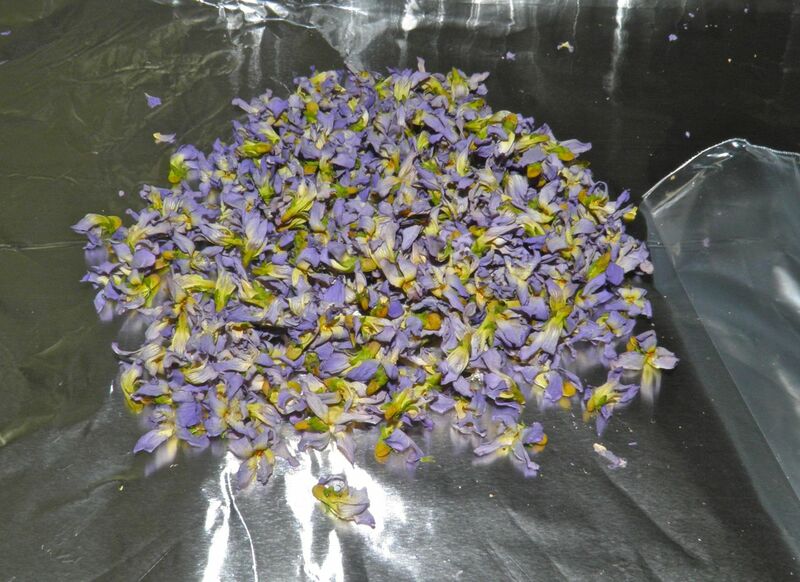 One of the most common uses for violets are candied as decoration on cakes or other baked goods. 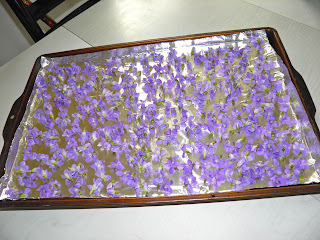 Candied flowers are very easy to make. Simply gently paint each bloom with beaten egg white and then sprinkle liberally with icing sugar. After drying. the colour is pretty much preserved. Violet flowers and leaves are completely edible when raw, but I wanted to try something a bit different, so needed to dry them. When I arrived home I removed the stems from the blossoms, checked for insect visitors, and put them on a baking sheet lined with tin foil. 45-50 minutes in a 250° F oven was all it took to dry them out. So now I have about 3/4 cup of beautiful blue, dried violets. What am I going to do with them you may ask? Well they don’t have a strong odour, but that colour… They could be crushed and sprinkled on foods to great effect. But I’m going to try and extract that blue into a liqueur. Unlike rose or lavender liqueur, the taste won’t be “violet” because they don’t really have any inherent scent. As I said earlier, they were kind of peppery. 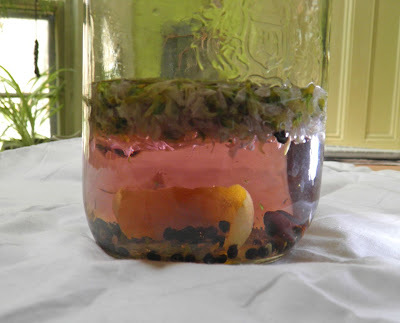 So I’m going to play up the slight flavours I did recognize with other botanicals. I’m hoping in the near future to have a delicately blue coloured peppery liqueur. It should be quite an interesting liqueur to pull out to serve friends. The full recipe will be posted in about a week when the liqueur is finished. Make sure you come back. one week. I have great optimism for the result.